The ultimate confidence-builder! It's time to learn Cantonese. 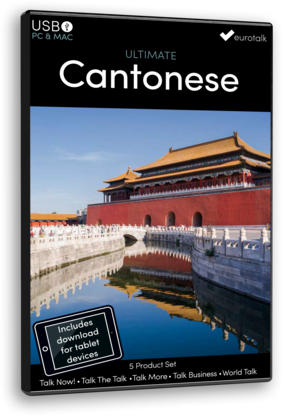 When you’ve completed this set of programs, you’ll be able to speak Cantonese with accuracy and conviction. The Ultimate Set also includes a companion app for your tablet, so you can learn on the move. Hours and hours of language content, all designed to get you learning through games and practice. EuroTalk’s Ultimate Set is invaluable for absolute beginners through to intermediate learners. It contains five full programs, which will teach you first words and phrases, then complete sentences. You will develop your speaking skills, hone your accent and train your ear. Each program targets one or more of these areas. If you’re new to a language, there are some basics you will have to learn, whether you’re eight years old or 80, on business abroad or a tourist on holiday. Talk Now! Cantonese offers a simple-to-use method for you to start learning the language, whoever you are. Talk More teaches basic conversational phrases with structures that can be adapted to fit different situations. It also tackles one of the main challenges in learning a foreign language: building the confidence to speak it. Talk More’s recording function allows you to compare your accent with that of a native speaker. Perfect for building a learner’s spoken confidence. Talk The Talk is designed with teenagers’ social lives in mind. It concentrates on the words and phrases young people need for social conversation, including plenty of useful, up-to-date vocabulary. It then builds their spoken confidence, allowing them to compare their accent to that of a native speaker. It's easy to be fazed when you start a conversation in Cantonese and the person you’re talking to replies using lots of words that you haven’t learned yet. World Talk prepares you for these real-life situations with addictive listening games. It will teach you to recognise key words in everyday situations and broaden your vocabulary.